According to the latest data from IDC out today, Apple continued its lead of the worldwide tablet market in Q2 despite a decline in overall sales. The report follows Apple’s fiscal Q3 earnings report last week where the company confirmed it sold just under 10 million iPads during the April to June quarter. That was a decline from the 11 million units it sold in the same quarter last year, but IDC shows Apple managed to slightly increase its market share as number two Samsung experienced an even larger decline in sales. Apple’s launch of its second detachable helped lessen its year-over-year decline to 9%, but more importantly it helped raise Apple’s average selling price (ASP) and revenue. Price reductions on previous generation iPads and the latest Pro iterations are expected to have the same effect for the remainder of 2016 as the consumer and enterprise audiences evaluate their needs… An overwhelming majority of tablets shipped this past quarter were Android-based systems (65%) followed by iOS, which captured 26%, and Windows for the remaining share. Following Samsung, Lenovo maintained its number three position with 2.5 million units shipped and 6.6% of the market, and Huawei in fourth grew 71% to 2.2 million units and 5.6% of the market. 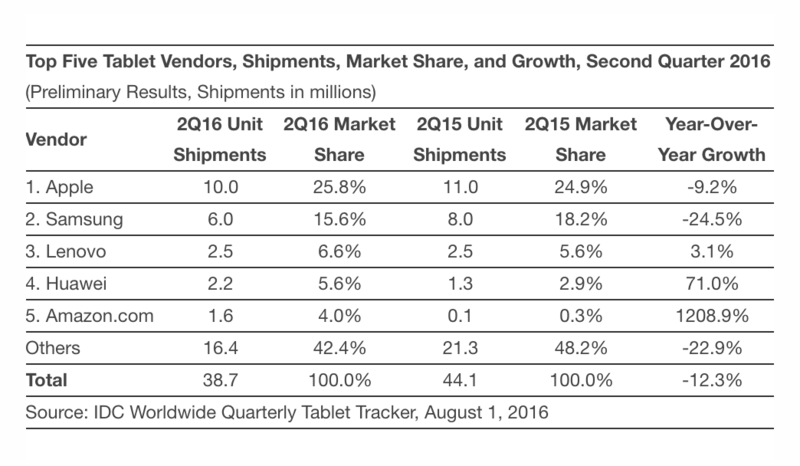 Amazon made it into the fifth position with 1.6 million units shipped and 4% market share. During its fiscal Q3 earnings call last week, Apple pointed out that the three-month period included ‘best iPad growth’ in 10 quarters despite a decline in unit sales. That included iPad revenue growth of 7 percent and an increase in average selling price to $419 following the iPad Pro launch.